Meet Cooper, Our Pet Therapy Puppy in Training! Meet the Newest Member of Our BrightStar of Delray Beach team, Cooper! We are happy to introduce you to our Pet Therapy puppy in training, Cooper. 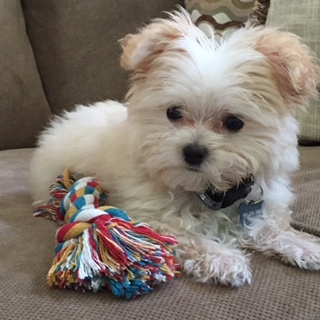 Cooper is a Morkie (mix Maltese and Yorkie) puppy who is playful, friendly and sweet. We started Cooper on the training process at just 12 weeks old, so Cooper can start to bring joy, happiness and smiles to our clients’ lives. It’s well-known (and scientifically proven) that interaction with a gentle, friendly pet has significant benefits. Interaction with a Therapy Pet can help to lower blood pressure, improve cardiovascular health, release endorphins (oxytocin) that have a calming effect and diminishes overall physical pain. There are also recognized mental health benefits including lifting spirits and lessens depression, encouraging communication, increasing socialization and the lowering of anxiety. After his training is complete, we plan to introduce Cooper to Home Care clients in Boca Raton and Boynton Beach.